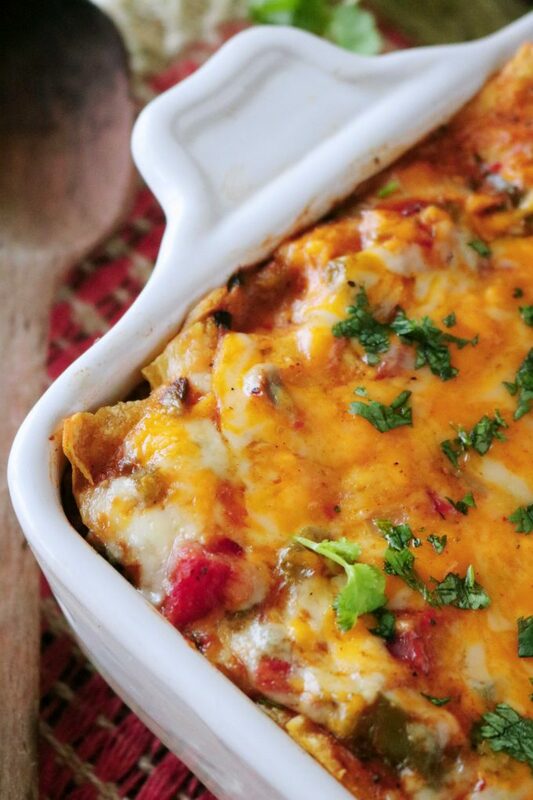 A recipe for the best King Ranch Casserole ever! 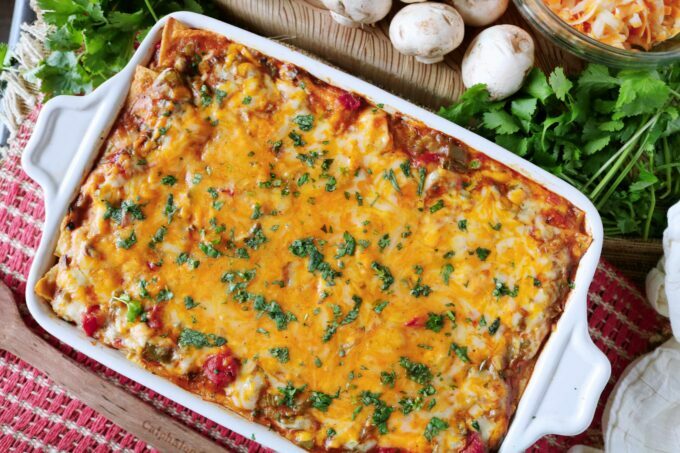 A famous Texas-born, stacked enchilada casserole featuring shredded chicken, corn tortillas, hearty vegetables, cheese, and a creamy Tex-Mex sauce. As a kid, I loved going out to eat. It was one of my favorite family activities. More times than not, we made our way into a Mexican food restaurant, and that was fine by me. Our family dinners at home usually consisted of comfort food meals like chicken fried steak, pot roast, and the like. Pretty tough upbringing, right? Mexican food was a warmly welcomed change of pace — still comfort food, only with a completely different flavor profile. On rare occasion, my mom would bring those beloved Mexican flavors into our home and put a big ol’ Texas stamp on it. That stamp read, “King Ranch Casserole,” and I have loved it my whole entire life. It was a special childhood dinner then, and it’s a special family dinner in my household to this very day. 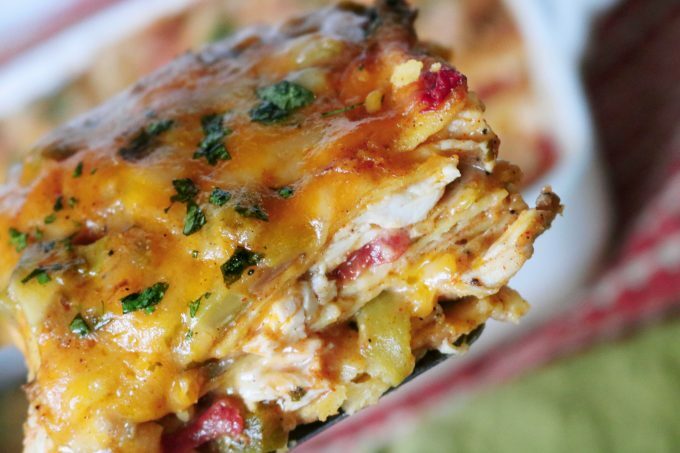 King Ranch casserole is a stacked enchilada casserole with layers of chicken, cheese, corn tortillas, and quite possibly the best part — a spiced chicken gravy. This is not your average chicken gravy, folks. It’s chalk full of vegetables like mushrooms, bell peppers, celery, and onion, and gets its Tex-Mex vibe thanks to chili powder and cumin. But wait! There’s more. Cans of diced, fire-roasted tomatoes, along with green chilis are added to the sauce as well, and I gotta tell ya, the flavor is here is deep, and nothing if not phenomenal. 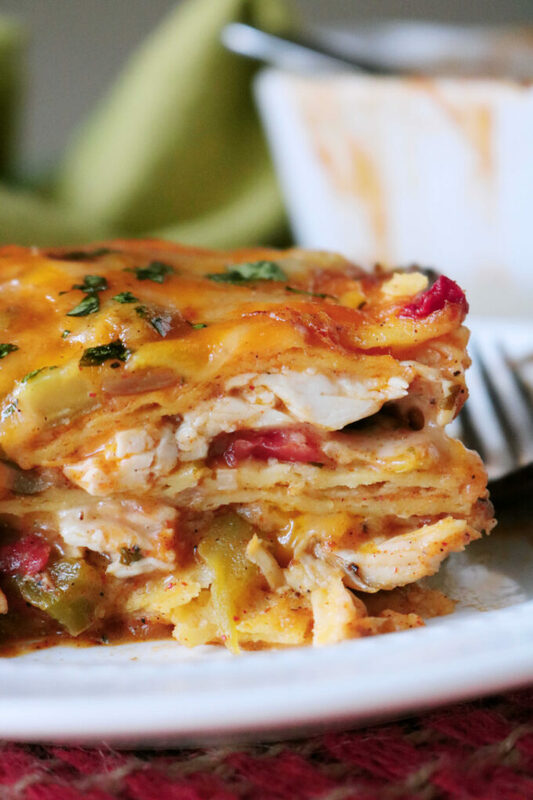 To make King Ranch casserole, you’ll need to have cooked and shredded chicken ready to rock. You can bake your own chicken breasts, or pick up a rotisserie chicken from the grocery store. Then, it’s time for the sauce, which as I said earlier, is essentially a chicken gravy. Oil, flour, and broth = gravy. However, like I also said earlier, this is not your average gravy, and it begins with a sautée of all those yummy vegetables on the stovetop. After the vegetables have softened, they get a sprinkling of flour (you could substitute gluten-free flour to make this a gluten-free meal), and the chicken broth goes in, followed by the spices and cilantro. The mixture bubbles until thickened, and the sauce is ready to go to work. 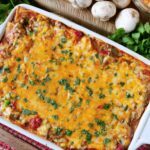 King Ranch casserole is a stacked enchilada casserole, which basically means you’re working with layers of corn tortillas. It begins with a little sauce on the bottom of the casserole dish to keep it from sticking on the bottom. Then on goes the first layer of the casserole: Corn tortillas, sauce, shredded chicken, and cheese. The pattern is repeated once more (so that’s two full layers) and ends with a top layer of tortillas, sauce, then cheese. The casserole is baked until bubbly, and as hard as it may be, I would advise you to let this one rest for about 15 minutes or so before digging in. This will give the sauce time to set up so that when you cut into it, ingredients don’t go oozing out all over the place. However, if you just can’t find the willpower to resist digging in right away, it does taste the same…no matter where it sits on your plate. So we know what King Ranch casserole is, we know how it’s done, and now, it’s time for a confession: This is not my momma’s King Ranch casserole. This version is new and improved. Mom’s version was made with a combination of various condensed soups, and while I totally get this can make dinner preparations a little bit easier, it doesn’t really hold a candle to what fresh ingredients can do to a sauce. And, if you couldn’t already tell, this recipe is all about the sauce. Fresh vegetables and herbs not only add vibrant, new flavors of the casserole, they add a pleasing variation in texture as well. 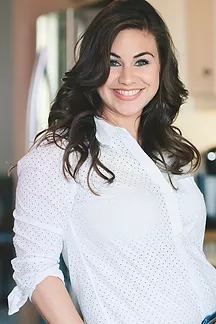 Now, don’t get me wrong, as a child, I loved mom’s version of King Ranch casserole, but after trying out Texas Monthly’s made-from-scratch version, going back to a make-shift Tex-Mex gravy would never be an option. In comparison to the Texas Monthly recipe I started out with, I cut back on both the amount of butter and garlic but upped the quantity of chili powder and cumin. Hello, flavor. Next, rather than roasting green chilis, peeling and seeding them, I opted for canned diced green chilis, and while I know using the fresh chilis would add more texture to the casserole, the freshly sautéed mushrooms, bell pepper, and onion were more than sufficient. Lastly, good-bye Rotel, hello fire-roasted tomatoes. Fire-roasted tomatoes have a deep, unparalleled flavor, and are total perfection in King Ranch casserole. These days when we go out to eat as a family, Mexican food restaurant’s are still the first stop on the radar. And no matter how big my arsenal of home-cooked, Tex-Mex recipes may be, there is only one that will forever remain at the top of my list, from childhood to this very day. King Ranch casserole will forever reign. Preheat oven to 375° and have ready a 9x13” greased baking dish. Place the halved tortillas in a shallow dish (like a pie dish), and pour over 1 cup of chicken broth. Set aside and allow to soak. In a large rimmed sauté pan over medium-high heat, melt together butter and olive oil. Add celery, onion, and bell pepper and sauté until softened and onions are translucent, 5-8 minutes. Add mushrooms and sauté until juices have released and they begin to take on a brown color, about 10 minutes. Add the garlic and sauté 30 seconds to a minute. Sprinkle over the flour and stir until a paste coats the vegetables. Slowly drizzle in the remaining 4 cups of chicken broth, whisking constantly until flour has completely dissolved and no lumps remain. Allow mixture to come to a boil, then reduce the heat to medium and allow to simmer about 5 minutes, or until the mixture has thickened. Stir in the tomatoes and green chilis and allow to simmer for another five minutes. Add the chili powder, cumin, salt, pepper and 2 tablespoons of cilantro. Stir once more, remove from heat and set aside. Combine the Cheddar and Monterrey Jack in a small bowl, and set aside. Spoon a thin layer of sauce on the bottom of the dish and then add a layer of tortillas. Add a layer of sauce over the tortillas, followed by a layer of chicken and then a third of the cheese mixture. Repeat with another layer of tortillas, sauce, chicken, and half of the remaining cheese. Add one more layer of tortillas, along with the remaining sauce, and cheese. Bake for 25-30 minutes until bubbly. Sprinkle with the remaining cilantro and set aside to cool for at least 15 minutes. Do you think I could substitute ground beef for the chicken? Yes, I think that would be a fine substitution! Could this dish be prepared the day before and refrigerated and then cooked the next day? Yes! I would think this casserole would freeze and reheat very well! I have not made this casserole in years as I try not to use canned soups if at all possible! Thanks for the yummy, from scratch inspiration!! Thank you, Liz! It’s one of our family favorites! !